Growing up, the only thing that could top your friend's birthday party that had a bounce house, was a birthday party with a Slip 'N Slide -- the real deal one that had two lanes and sprinklers along the way. If only you could relive those halcyon days of your childhood... OH WAIT, you can! 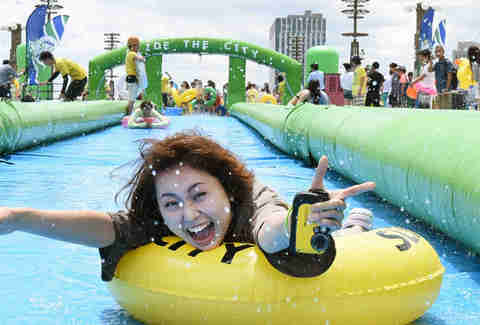 This Saturday, there are going to be three 300ft Slip 'N Slides set up at Montrose Beach, and we've got the details. 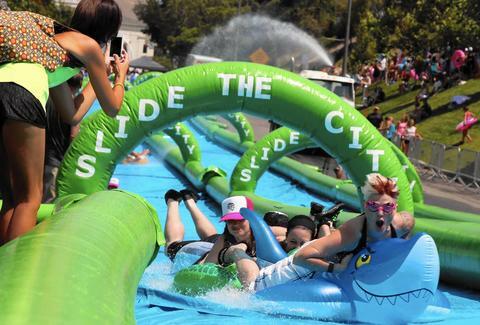 From 10am-6pm on July 30th, Slide the City brings its touring mega-waterslide to Chicago on Cricket Hill at Montrose Beach (the steepest hill they could find). Riders ages 5 and up will take turns tubing down the padded slide, all laughing at their one friend who fell off their tube. There will be tunes, food trucks on site, and parking near Carpenter Park. Tickets are available here. Purchase comes with a wearable bag to keep your stuff in (which will get soaked) and an inner tube -- you can also bring your own tube/inflatable shark if you please. Use the promo code "Chicago" for 10% off admission. Pro tips: spring for the unlimited rides and wear shoes you're comfortable getting wet so you're not the hot mess who keeps losing their flip flops. Sean Cooley is Thrillist's Cities senior editor and he remembers to wait 30 minutes to Slip 'N Slide after he eats. Follow him: @SeanCooley.